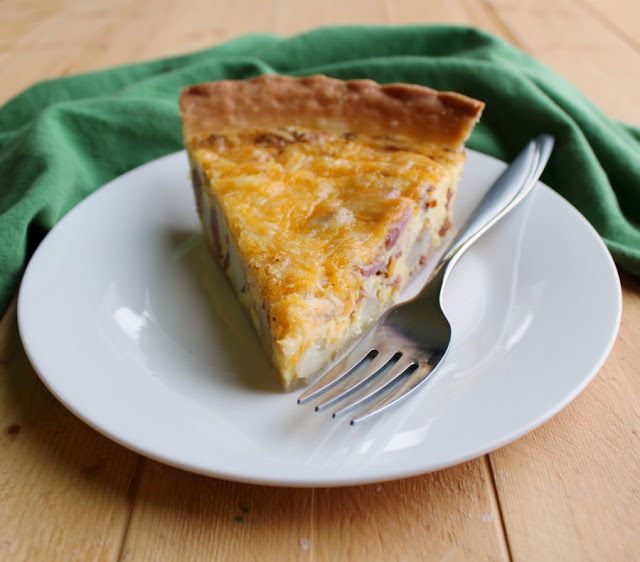 Enjoy a slice of ham, potato and cheese quiche any time of day, it's always good. Your whole family is sure to love it and you can customize it easily too! Quiche does not have to be pretentious or fancy. In fact, it is a perfect low key meal. It comes together easily and can easily be adapted to fit your tastes. 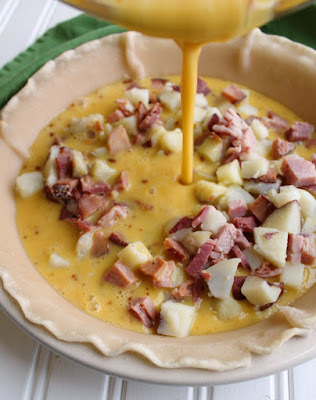 This super simple ham, potato and cheese version is sure to be a hit, even with pickier eaters. Quiche is such a versatile food. It is perfect for breakfast, brunch, lunch or even dinner. Plus you can make so many variations by switching out the stir ins. This version keeps it simple with ham, potatoes and plenty of cheese. Even the kiddos will be asking for more. One of my husband's strange quirks is he doesn't like baked eggs. He basically refuses to eat breakfast casserole and quiche is not on his list of favorite things. I love him anyway, but sometimes it's hard. 😉 Despite his known aversion, sometimes I test the waters. Mostly I do it because I love breakfast food and I can't completely give it up! 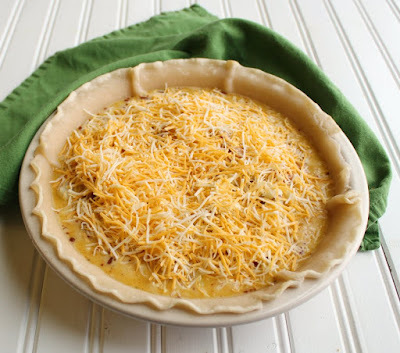 So I made this quiche along with a bunch of other food one snowy weekend day. I fully expected him to mostly ignore the quiche and I was completely ok with the idea of having the leftovers to bring to work for lunch throughout the week. So imagine my surprise when he got a second piece and told me it was the best quiche he's ever had. I was even more shocked when he willingly helped himself to the leftovers the next day despite there being plenty of other options! I guess I have a winner here! I ended up having to bring other leftovers for lunch instead! Of course you can adapt this super easily. If you don't have any ham, you could always thrown in a handful of crumbled bacon. Instead of colby jack cheese you could use cheddar, swiss or a combination. If you want to add vegetables, go ahead! I just recommend you saute them for a bit first to soften them and cook out some of the liquid. There really are no limits to how you can make this your own. I like to serve a slice with some fresh fruit if I'm serving it at breakfast or brunch. A side salad makes it feel like a complete meal at lunch or dinner. Don't skip precooking your crust a bit. This keeps all the quiche-y goodness on the right side of the crust. You don't want it leaking through. If you would like to add in some vegetables, go for it! Just saute them down first. This gives them a better texture in the final product and keeps the filling from getting to much liquid. Don't bake it until it is fully set, you want the center to still have just a tiny bit of wobble left. The edges should be set and the center should be mostly there, but not all the way solid. Have fun experimenting with different cheeses, spices and mix ins! Bake it on the bottom rack for a more flaky crust. Are you a quiche fan? What are some of your favorite filling combinations? Bake at 350 F for 10 minutes. Remove from oven and remove pie weights from crust. 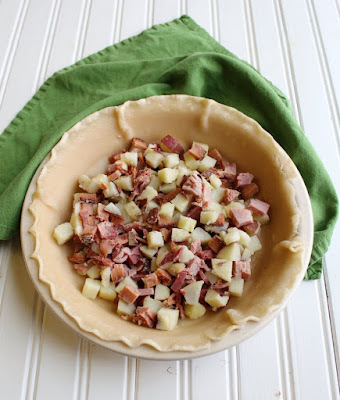 Mix together ham and potato cubes and place in parbaked crust. In a large mixing bowl, beat together eggs, milk and spices. Pour over ham and potatoes. Sprinkle with cheese and bake on the bottom rack for about 35-40 minutes. Check the crust as it bakes and cover with foil or a pie guard if needed. The edges should be set and the center should have just a bit of wobble left when it's done. Allow to cool for at least 5 minutes before serving. It is great served warm or at room temperature. That is a great idea! I need to start freezing slices too. That would make for a great quick meal later. I love quiche! For awhile I was all about the frittata because they were so quick, easy and low carb, but thee is nothing as good as quiche! I can see why your hubs would love this marvelous meat and potatoes version, especially with all that scrumptious cheese! Yum, Carlee! The filling combination must have been "manly" enough for him! ;-) Thank you! Hi Carlee, I am not a fan of quiche. I still have flashbacks of wet mushrooms 'floating' on the ones Mum used to make for Sunday tea, but I have had a nice bacon and onion one before. Potato is an interesting addition. I think when the weather warms up I may well try this as a light lunch with a salad. I could see floating wet mushrooms being a turn off! That definitely won't happen with this filling. I hope this changes your mind! 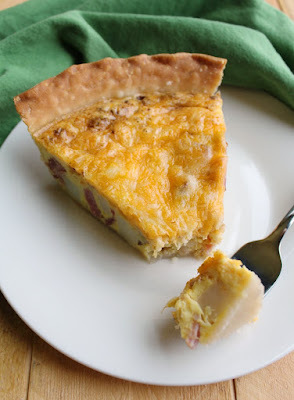 I LOVE quiche and I think a good one has to have these ingredients! I'm happy having others, but ham, potatoes, and cheese have to be there! Love this. I like other fillings too, but this is a great place to start! This quiche looks delicious. We love breakfast foods. Little Dude and I do too! My husband is skeptical about breakfast for dinner, but we're getting to him! I've never made a quiche, partially because I figured my husband wouldn't touch it. I might just test those waters! This filling might just be manly enough to win him over! It's definitely a heartier version of a quiche so it would be a good place to start!